After such a great first week, one could have imagined it would be hard to beat! But thanks to the generosity and dedication of Jean, we all had a really wonderful day out. The day started off with a beautiful breakfast laid out for us by the staff of the e5 bakehouse in London Fields. We all enjoyed sharing bread and coffee together whilst talking about our weekends and various things we have going on. The women from Iran were in particularly high spirits because it was Iranian new year so we all learned a lot from them about their new year celebrations and calendar. After breakfast, Ed, one of Jean’s colleagues, gave the women a tour of the bakehouse. It was heartwarming to see how enthusiastic and intrigued the women were. The flour mill at the heart of the bakehouse was a source of particular interest. The women eagerly explained the names and uses of various grains in their native countries. It was fascinating to hear about the multiple different ways to cook buckwheat and how universal it is. The bread-tasting part at the end of the tour also created a hive of bubbling chatter as some of the women had never really tasted a sourdough loaf before and were very excited about the discovery of this new flavour. The highlight of the day was Jean’s idea to go for a tour of the Paul Rhodes bakery in Greenwich. 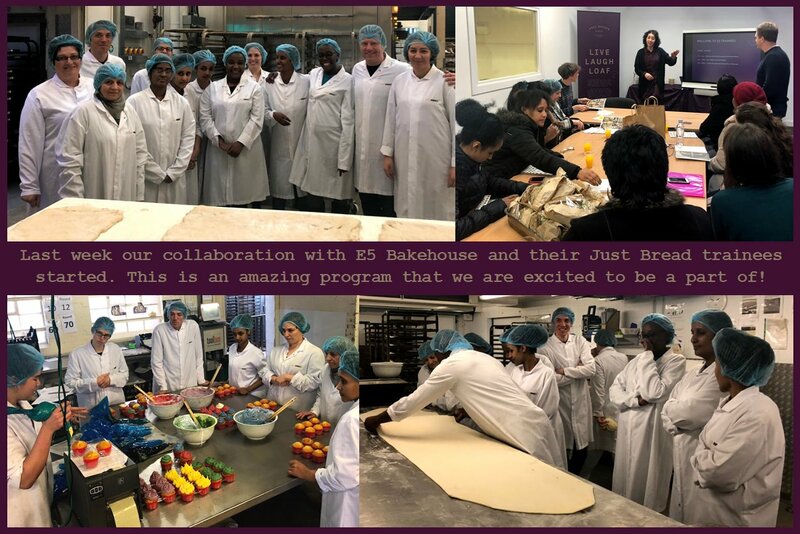 It gave the women an exciting cab tour of east London and also a chance to learn about a more commercial bakery. The staff of Paul Rhodes were absolutely lovely and gave the women a really heartfelt welcome with lunch and an amazing array of cakes and pastries. They gave us all a really great in depth tour of all parts of the bakery and the women got particularly excited about the croissant section. Perhaps the most fun part of the day was the cake decorating at the end. It was incredible to see just how talented the women are! They produced cakes and cookies that looked stunning and completely professional, it was really inspiring. The whole day seemed to inspire and support the women on so many levels. They all seem increasingly motivated to cultivate their baking talents and learn more about baking here in the UK. They all seem so grateful and happy to be able to be supported and guided here and they all left, armed with cakes and cookies, buzzing for week three. A new course and a fabulous new group of women!